Oak Hall is conveniently located in the center of Holly Springs, right down from the new sports complex currently being built. Oak Hall real estate feature a wide variety of styles and prices. Construction of the subdivision started in 1994 and was completely built out in 2010. Homes start out in the low $180's and have sold for over $400k. From small ranches to spacious 2-story's the residents really like Oak Hall. Definitely shows with the low turnover on such a big subdivision(495 homes). The development features a large playground that even includes a basketball court right next to the community pool. You can learn more about Oak Hall on there community page. 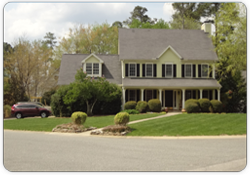 The HOA dues are currently $30 monthly and managed by PPM out of Raleigh. If you have children and schools are important to you, check out our Holly Springs Schools page. If you know the property that you're interested in buying, you can click on the base school assignment to see what schools have been assigned to the address. Make sure you check out the Holly Springs Market Report page to download this months report on the overall conditions of the housing market. Take the time and learn whats going on locally.